Maslenitsa came to Yaroslavl. The First Maslenitsa events took place on Wednesday, February 10, in Museum-Reserve. A lot of pupils took part in it. 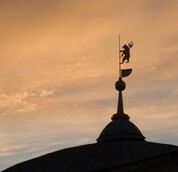 Maslenitsa events started in The Yaroslavl Museum-Reserve. The First participants of a Maslenitsa cortege were pupils. Many customs of this holiday have been forgotten after thousands of years. For example, forefathers didn't make only the main Maslenitsa scarecrow, but there were some baby-dolls made with tree branches, haulm and rags to throw in a general fire. Earlier all families had such experience. They are personal Maslenitsa dolls. They could be made in the first Maslenitsa day to be burned in the last one. Or they could be carried for the whole year to be burned next Maslenitsa on the Forgiven Sunday. After tea with pancakes the participants went out to carry the winter out. The main celebration happened on Thursday, Friday, Saturday and Sunday. They were consist of travelling theatres, dolls actions, bears appearance, slide skating and, of course, Maslenitsa songs. The main character of the ceremony is Maslenitsa scarecrow. At old times the haulm doll could be female, as well as male. Its clothes were collected from all of the houses. The main idea was that the suit should be old, rattletrap and lacerated. It was thought, that all of the troubles, ill lucks and diseases are burned out together with the scarecrow, and also a wish made at this time will realized for sure. The Maslenitsa scarecrow have been used to be burned on the Forgiven Sunday. But according to the organizer's opinion, this ceremony can appear on weekdays, also. Because the point is to tell younger generation about Russian traditions. Tuesday, February 16, 2010 in News. You can comment.